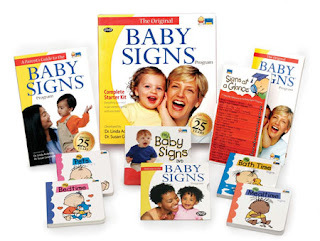 Pay $25 for $50 Worth of Baby Sign Language Products! Head over to So Lo La' Deals to score a voucher good for $50 worth of Baby Signs products for only $25! The Baby Signs Program is a natural baby sign language that allows babies and their parents to use simple signs to communicate important things like being hungry or thirsty, hot or cold, afraid or sad-often a full year before babies could otherwise speak. You can use your voucher on DVDs, books, flash cards and more. You can also get a starter set or use it towards the complete DVD series.